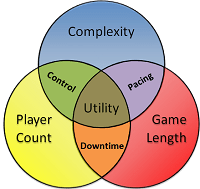 To finish out 2014 we’ve been examining dependent characteristics of games: Downtime is driven by the number of players and length of a game and Pacing is determined by the length and complexity of a game. These are typically secondary considerations of game designers but they deserve attention since they are quite often the primary consideration of players when we reflect on how much enjoyment we find in a game. Our third dependent characteristic encompasses a factor that shows up in many gaming complaints; how much control do players really have over a game? In one form or another we probably have said, thought or heard at least one of the above phrases. While each thought comes from a different cause, they all lead to the same effect: a player feels marginalized in their role. Games are usually played to make interesting decisions and achieve some sort of result. It is this cause-and-effect that can be a motivation for some types of gamers and this can be a decisive factor for how much enjoyment players find in a game. But when a player doesn’t feel like they have any control over their surroundings their experience diminishes from playing a game to observing an activity. Player control is at a crossroads of old and new for us as we’ll touch on some new topics like luck and skill and revisit some old ones like positional balance and player engagement. Player control is an intersection of a plethora of ideas and it also functions as a subset of player interaction, another topic we’ll look at in the future. Do players really hate luck in games? A good design offers opportunities to mitigate risk or effectively manage risk so I don’t think this is even what they mean. Players simply don’t like the idea that randomness exerts just as much or more control over their final position as they do. Who wants to feel disempowered in an activity you’ve spent the last hour participating in? Two video game series I’ve played based on recommendations in the last few years are the Mass Effect series and Telltale’s The Walking Dead series. These franchises have been extremely popular for plenty of reasons: they are well-written, deal with interesting subject matter, and accessible to a wide audience. Without digging into the specifics of either, both series also add an interesting layer of storytelling by asking players to make tough choices which determine later events in the storyline. It’s a really wonderful method of engaging players by allowing them to create their personal storyline and its been around in plenty of forms from RPGs like Dungeons & Dragons to the lure of the recent Dead of Winter. If you’ve played either the Mass Effect series or The Walking Dead game, you’ve probably considered at least for a moment which decisions actually affected the outcome of the game and which really didn’t do much at all. Depending on who you talk to it can range from a minor complaint to a disappointing realization as these games imply meaningful decisions and (some of them) deliver linear conclusions. Understandably video games are a different medium, but this same concern and a similar argument carry weight in board games: we want to see our actions affect the outcome of a game. 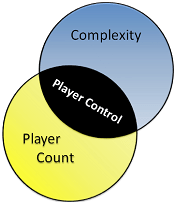 Player control is the extent to which a player’s actions help to determine the outcome of the game. These series receive criticism for the illusion of choice, that is player’s decisions are less meaningful than they initially appear to be. Illusion of choice ties back to one of our earliest topics: the pitfalls associated with false decisions. Illusion of choice is only one concern of player control but it serves as an introduction to the type of complaints we all wish to avoid. The remainder of this article is an opportunity to look at some of the frustrating circumstances in games that lead to a loss of player engagement. I’ll preface this by saying I don’t think many of these frustrations have solutions, but this is an opportunity to point out some common pitfalls in games that can be identified as potential concerns during playtesting of your next game. What leads to diminished player control? Quantity of Luck: Calamity Calvin starts every game with a solid strategy. But after a few rough die rolls he’s buried so deep in scoring that he has little to no influence over the remainder of the game. Player Skill & Experience: Puerto Rico has very little luck at all. Unless of course, you randomize where Sharkmeat Steve gets to sit around the table. Sharkmeat Steve has no chance at all of winning the game but will almost certainly decide who does win through inexperience, sub-optimal play and passing premium opportunities to the player after him. Puerto Rico is a game optimized for players of similar skill levels and drastic differences in experience levels can cause some players to have a disproportional swing over the outcome of the game. Player Driven Chaos: Sometimes game mechanics and interaction with other players can be just as much of an obstacle as luck. “NFW” Nate can’t catch a break. In Blokus everyone independently decides to converge on his corner. In Power Grid the other players end up buying every single coal before he can take his turn. He faces two Coup attempts before he can become an unsuccessful dictator. None of these outcomes involve any luck, and maybe some can be avoided, but sometimes the powers at will remove your own power. “NFW” Nate’s lack of power is widely considered a terrible superpower, but he’s not allowed to switch it out because Marvel and DC Comics picked all the good ones before he got his turn. These are just a few example areas that can discourage players from enjoying a game. Calamity Calvin blames his random number generator. Sharkmeat Steve’s opponents blame him. “NFW” Nate doesn’t know who or what to blame. This loss of control by players can eventually turn into other problems. When player’s lose power they might see an opportunity to exert new power through kingmaking opportunities. We’ll touch on luck and skill some as we proceed but let’s take this opportunity to look at some new areas that create these same discouraging experiences for players. How about player interaction and game mechanics? Player interaction is a fickle thing. If you’ve played Ticket to Ride a few times you’ve probably seen it in action. Players race to lay down track, connect routes, manage cards and try to maximize score. This all leads to great player interaction. Occasionally there is an opportunity where you can throw down a few trains and block me from completing my route. While unpleasant for me, this is also great player interaction – you’re sacrificing something while still looking out for your own best interests. An unfortunate aspect of the player interaction in Ticket to Ride is that one player can inadvertently derail an opponent’s entire plan by placing a track without any even being aware of it. Getting blocked intentionally is frustrating but an intended possibility with the freedom of the mechanics. Getting blocked for no particularly great reason is just frustrating. Your opponent’s may get some schadenfreude from the encounter but watching your engine explode before it leaves the station isn’t enjoyable on any continent. 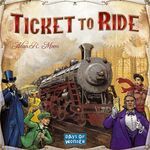 Of course this isn’t really something that could be changed about a game with the mechanical scarcity of Ticket to Ride. Players competing over space will naturally tend to get in each other’s way. A negative externality like this can can unfortunately end up defining the experience for the unfortunate individuals on the receiving end. In the case of Ticket to Ride, inadvertent blocking tends to happen as the game increases in the number of players, since both two player games and five player games are competing within the same limited space. As players are added to a game, all players lose a proportional share of control. As we’d expect, in a three player game we usually have around one of every three turns. Once we add a few more players, each will have a smaller share of the collective turns in the game. This can be exacerbated when Player A ends their turn followed by Players B, C, D & E make big changes to the state of the board. By the time Player A gets another turn, it is basically a different game, and not one they had much power over creating. The structure of some games is really only suited to specific player counts or skill levels. As we see with Puerto Rico, an inexperienced player can shift the atmosphere surrounding a game. In some cases we’ll look at, adding players to a game can lead to unintended consequences on how existing players can control the outcome. Let’s look at several functions in games that can be disproportionately influenced by player counts and changes in complexity. Several games rely on information being in the hands a few in order to be most effective. Pandemic comes to mind as a game that is more favorable or easier to win with fewer players. Adding players ends up spreading the same cards and actions over more players. Since players need to accumulate sets of cards, being able to handle ~50% of the cards (2-player) and ~25% of the cards (4-player) is significant. In the case of Pandemic, more players creates the effect of “too many cooks in the kitchen” which increases the difficulty of the game. Concentration of information and actions can be mechanically favorable in plenty of cooperative games but it also brings us back to discussing skill and experience levels. Hanabi has so many conventions and tactics that adding just one new player to an impatient group of veteran players can wreck their chance of success. Ineffective and misunderstood clues, additional strikes and lower scores are inevitable and part of the game when teaching new players. Adding more players also disseminates the cards and turns so that it is simply more difficult to convey information among more players. Hanabi is a game of communication and so players need to be on the same page. More players greatly increases that chances that someone is reading the wrong book. Hanabi can also fit right here alongside The Resistance when it comes to conveying information and adhering to social conventions in games. Sometimes there are “group think” ideas which can cause frustration for players who don’t follow a common procedure. In nearly every game that uses teams, success relies on how your team members act. One strange-acting spy in The Resistance probably won’t determine the game so long as they don’t give away the identities of the remaining spies. The members of the Resistance don’t share the same luxury as one strange-acting Resistance member will almost certainly throw off their teammates and lead to a defeated uprising. We see a similar idea exist in games where teaming up on the leader is necessary to suppress potential victory. Games like Munchkin, King of Tokyo, Coup and Kill Dr. Lucky each offer their own flavor of reverse kingmaking positions where players are expected to pile on and attack the (current) greatest threat at the cost of building up their personal standing. When someone deviates from this trend it can trigger the end of the game for other players. Some times it can just be a matter of group-think. A similar idea exists in the world of professional Poker tournaments. When poker gained a sudden spike in popularity more than a decade ago, many professional poker players were frustrated with how opponents were playing. As tournaments increased in size, more variables and styles of play exist and player driven chaos takes effect. Experienced poker players that were knocked out of tournaments by inexperienced amateurs would vent that the new player didn’t “play their hand correctly” or “made the wrong sized bets” when they felt opponents misunderstood the relative strengths of their hands. Of course games are great because there is no strict strategy guide players must adhere to, even if other players will be frustrated by unorthodox play. It is wise for game designers to pay attention to how much a game is dependent on everyone adopting a specific mindset. Players who don’t play “correctly” can feel inadequate and experienced players can feel like their entire game is dependent on someone else. Tzolk’in: The Mayan Calendar offers several primary strategies to players can pursue. Unfortunately at least one is noticeably influenced by how many players are using it. When two or more players follow the same path, their individual success is diminished by competition while a third player can pursue an alternate strategy alone with a better chance of success. Area control games can be the common offenders in this category since two opponents can find themselves trapped fighting over the same areas ensuring mutually assured destruction. Since the loser is often eliminated from contention and the winner is severely weakened, both can feel powerless over their combined situation. Think of this as a player feeling positive about their situation having built a small, well-defended and strategically sound empire. After their turn, each of the four opponents take significant turns which affect the entirety of the battlefield. At the beginning of the following turn, through no particular fault of their own their empire is in shambles and their enthusiasm is lost simply because they were in the wrong position at the wrong time. As we’ve discussed, in many cases there really aren’t any pure solutions. Some games will be prone to get out of hand and players will fall behind. this is an opportunity to consider some warning signs. These are factors that can allow a game to quickly get out of control and cause players to feel ineffective for the remainder of the game. Any game that gives players a chance to trigger additional turns can cause disproportionate control. In Tongiaki players start every turn adding boats to an island. If this fills up a beach on that island, the boats depart. If the boats reach another island they fill the beaches and can cause another voyage. It isn’t unusual to see one player chain multiple voyages together on a single turn while an opponent may not trigger any. Similarly in Risk one player may have the opportunity to knock out an opponent and get their cards. They can then turn those cards into more units on the next turn and target another player, take their cards and so on. When you give players the chance to deal a heavy blow to an opponent, over time these actions can disproportionately target certain players. These games often require “bashing the leader” which can be effective method of moderation when it works but can also be turn into a form of player elimination. Player control encompasses the player experience from many perspectives. While this post only glossed over a few areas hopefully it can be of benefit when considering how player decisions translate into player performance. When things can change dramatically over a short period of time, a player can quickly get left behind. Thanks Niklas, we appreciate your feedback!